Ain’t No Party Like A Tollwood Party – Sunshine. Whimsy. Tacos. I rang in the new year with Hanley and Esther at the awesome 2012 Tollwood Silvester Party. Hanley wrote about it in her own blog, so if you read both of us, this will seem like a bit of a repeat. 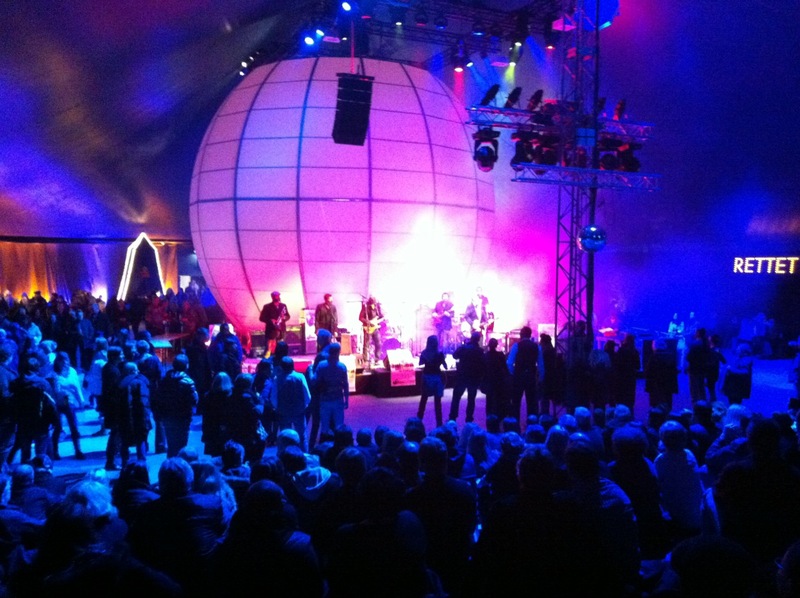 The Tollwood Winter Festival takes place at Theresienwiese, a 420,000 square meter (4,500,000 sq ft) space in the city of Munich. This is the same space that holds the world famous Oktoberfest each year. Tollwood is also a summer festival with a tremendous amount of live music- the 2013 Sommerfestival lineup so far includes ZZ Top and the Pet Shop Boys. I’ll probably wind up there at some point. 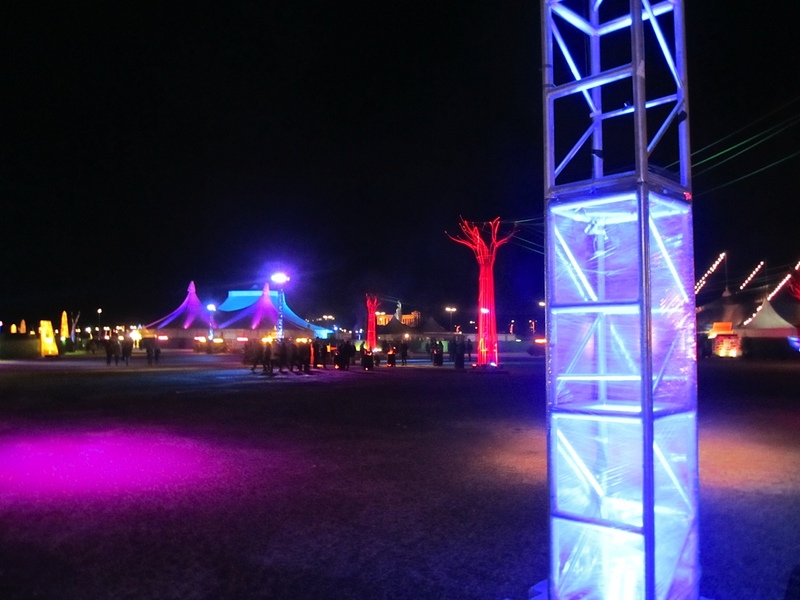 The Winterfestival wraps up with a giant Silvester party on December 31st. There are four giant tents with bands and DJs. There’s another tent that is nothing but various types of food. The various tents are on the outer edges of a vast open space where people can congregate to view fireworks. We’ll get to that. This is the view in from the front gate. When I say tent here, I’m not talking about the little things you use to go camping, I’m talking about things that are larger than the building my apartment is in. This is inside the tent for the first band we watched, the Stimulators. You can see the roof of the tent sloping up behind the giant sphere- these things were huge. We also saw a pretty nifty band called Jamaram in one of the other tents. They’re a pretty large group. We spent the last hour in a tent watching Rockomotion, a classic rock cover band. Pretty much everything they played was recognizable. They even did Hip To Be Square, and the last song they played right before midnight was The Time Warp. If you search for Rockomotion on Youtube, you’ll see lots of clips of them doing well known songs. The band stopped a few minutes before midnight to allow everyone time to get out of the tents and into the big central open area, and then there were fireworks. Lots of fireworks. The Theresienwiese is in the center of an access road called Bavariaring, and there were fireworks visible for 360 degrees- all along the Bavariaring. The fireworks went on for more than twenty-five minutes. Some of it was official Tollwood fireworks, to be sure, but some of it was just the German people setting off their own fireworks. This was my second New Year’s Eve in Germany, and I realize now that the Germans are kind of insane when it comes to fireworks. They use a lot of them, they don’t much care where they’re pointed, and they don’t seem to worry about their own safety. It sure makes for a hell of a show, though. Imagine twenty-five uninterrupted minutes of fireworks at the quantity and frequency of what you can see in the video below. (The video is only three seconds long because I thought my phone was set to still pictures, not video.) The Tollwood party was great fun, even if I did get the flu while I was there. Where did the rest of you ring in the new year? SUCH a great time! Summer Tollwood, here we come! Summer Tollwood? I’m so down!!! I can’t wait to see the full line-up for this summer. We should get a Bloggerspedition going to Sommerfestival. Oh no! The flu is mega going around Germany, I know so many people that have had it and passed it on. Feel better! Looks like a really fun evening! I’m just glad I got sick in between Silvester and this next busy weekend- I had enough down time to go through the various stages of flu. I’m at the tail end of it now, so I should be fine by midweek. Oh my gosh, that looks awesome! Every time I’ve been in Munich and not at Oktoberfest, that area is just an enormous concrete blah… so happy to see that they do actually use it for something else! And bloggerspedition, yes please! 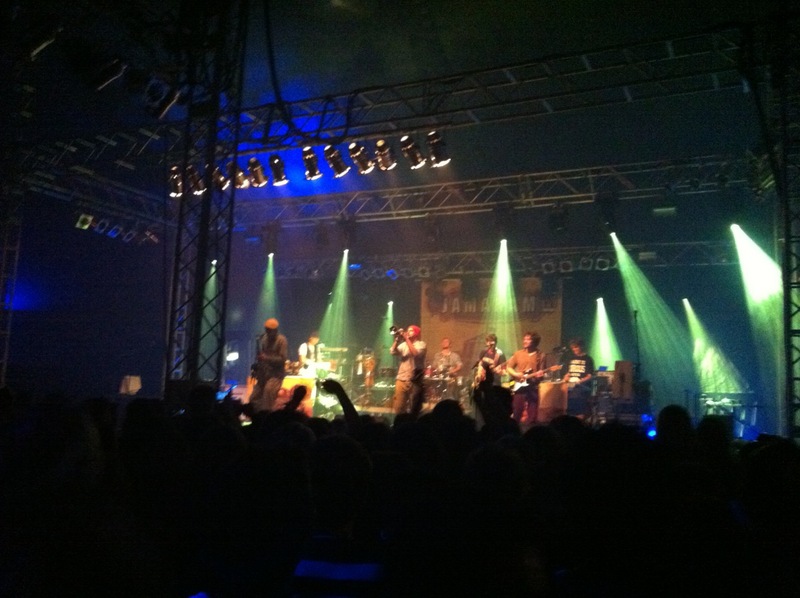 Wait, is this Jamaram band… reggae… in English… AND German!? :O It’s freakin’ groovy!